To be honest, this cranberry salad recipe, with its sweet & tangy cream cheese topping, is probably more of a dessert, but we serve it as a side dish at all of our holiday dinners… SO good, a MUST TRY recipe! I honestly don’t remember when this cranberry salad recipe first started making an appearance at our family’s Thanksgiving dinner table. Somewhere along the way, a lovely little slice made its way to a separate plate at my place setting, and from then on it was a yearly tradition — right alongside my Grandma’s cream corn casserole. It wouldn’t feel like Thanksgiving without these two dishes! Oh wait… You caught that separate plate thing, huh?! Have I mentioned that I absolutely cannot stand to have my food touch? Can’t. Stand. It. So if you’re planning to invite me to a large dinner at your house, plan on having extra plates available for this mama! I mean, it was made with cranberries, eeewwwww! At that age, cranberries ran a close second to asparagus. In my mind they were sour, slightly tough, and generally to be avoided at all costs. And Jell-o?!? Um, no thanks — pass the mashed potatoes, please. But then I took my obligatory bite… and my world was forever changed. Seriously. 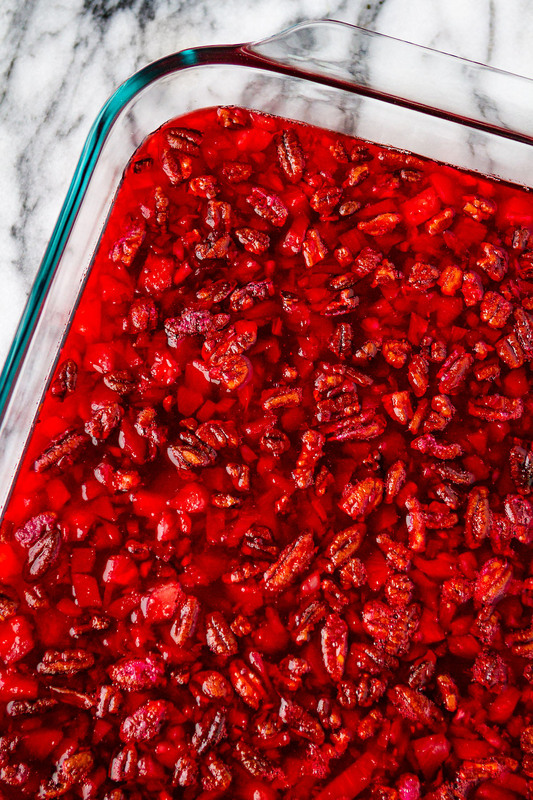 There are so many flavors and textures going on in this cranberry jello salad. Layers of ingredients that I never would have thought about pairing, but somehow they JUST WORK. And the results will rock your world! The pineapple and Jell-o add just enough sweetness to counter the tartness of the cranberries and the cream cheese/sour cream topping. I mean, really — how can you go wrong with that combination? 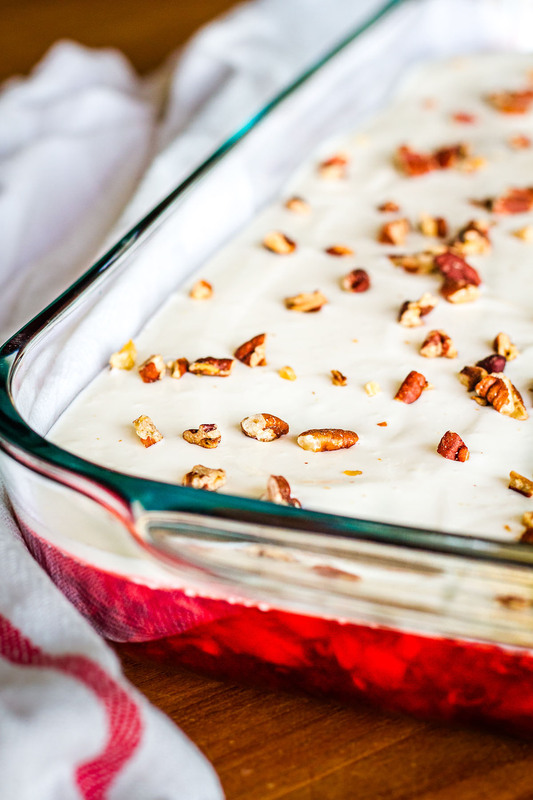 Top the whole thing off with plenty of toasted walnuts or pecans for a bit of crunch and extra flavor, and you’ve got a to-die-for salad/side/dessert whatever-you-want-to-call-it. Easy Cranberry Salad Recipe: Dessert or Side? I should note that I don’t JUST serve cranberry salad at Thanksgiving. It’s also ideal for Christmas dinner, Easter dinner, really any time. My kids request it often throughout the year, and I’m always happy to make it! And why not? It’s so darn easy to make! 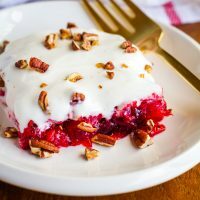 The cranberry jello layer is simply a mixture of raspberry Jell-o, whole cranberry sauce, crushed pineapple, cranberry juice, and toasted walnuts or pecans. 1| I’ve forgotten to buy the cranberry juice before, and if that happens, you can just substitute an equal amount of water. The end result is slightly less tart, but if your family won’t drink the rest of the juice, you may want to just skip it and avoid the waste. 2| DO NOT use fresh pineapple in this recipe. Fresh pineapple contains an enzyme called bromelain, which will prevent the gelatin from solidifying. Use canned crushed pineapple, as the bromelain is destroyed during the canning process. Now go make this cranberry salad recipe now! PIN IT NOW! CLICK HERE TO ADD THIS CRANBERRY SALAD RECIPE TO YOUR THANKSGIVING RECIPES BOARD ON PINTEREST! To be honest, this easy cranberry salad recipe, with its sweet & tangy cream cheese topping, is probably more of a dessert, but we serve it as a side dish at all of our holiday dinners... SO good, a MUST TRY recipe! Dissolve the raspberry Jell-O in the boiling water. Add the crushed pineapple (juice and all), whole berry cranberry sauce, cranberry juice, and your choice of nuts to the Jell-O mixture. Reserve a small amount of the nuts to sprinkle on top. Mix well. Pour into a 9x13" glass baking dish and refrigerate until firm, about 2 hours. Cream together cream cheese, sugar, and sour cream with a hand mixer until smooth. When the cranberry jello mixture is firm, spread the cream cheese topping over the top. Garnish with additional chopped toasted walnuts or pecans. Refrigerate for about an hour to allow the topping to firm up. DO NOT use fresh pineapple in this recipe -- it will prevent the gelatin from setting up. I’ve head from SO many of you that you hate to cover up the beautiful cranberry jello layer, and I totally get it. This is one reason why I prefer to serve it in a 9×13″ Pyrex glass baking dish — so you can see that gorgeous ruby red color through the side. But you can totally offer your guests the best of both worlds. Simply prepare the cream cheese topping as directed in the recipe, and refrigerate it in a separate bowl. Then you can just top each slice off with a dollop when serving. Either way, don’t forget to save some extra toasted walnuts or pecans for the garnish! I’d love to see how your cranberry salad turns out… Tag me @Unsophisticook on Instagram or use the hashtag #Unsophisticook so I can check it out. Enjoy! How do you prefer your cranberry jello salad, with or without the cream cheese topping? I’ve been making this for at least a year now. We serve it a lot! Delish! The only substitution I make is I use cran-cherry juice instead of the plain cranberry. Thanks so much for the recipe! Ahhhh…this beautiful recipe has my tastebuds fluttering with excitement! 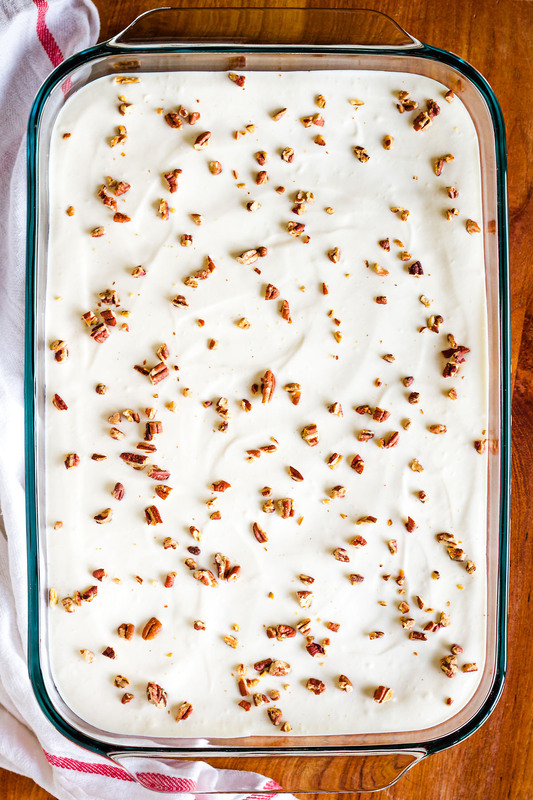 Thank you so much for sharing this perfect Thanksgiving side dish. Oooh, I would love to see this on my Thanksgiving table! I love these kinds of sides that are questionably a side dish and a dessert at the same time! This is now my favorite “side dish”! So tasty and easy to make. Perfect for the holidays! Such a nice option for a side for Thanksgiving or Christmas. So festive. This is such a great idea for cranberries! 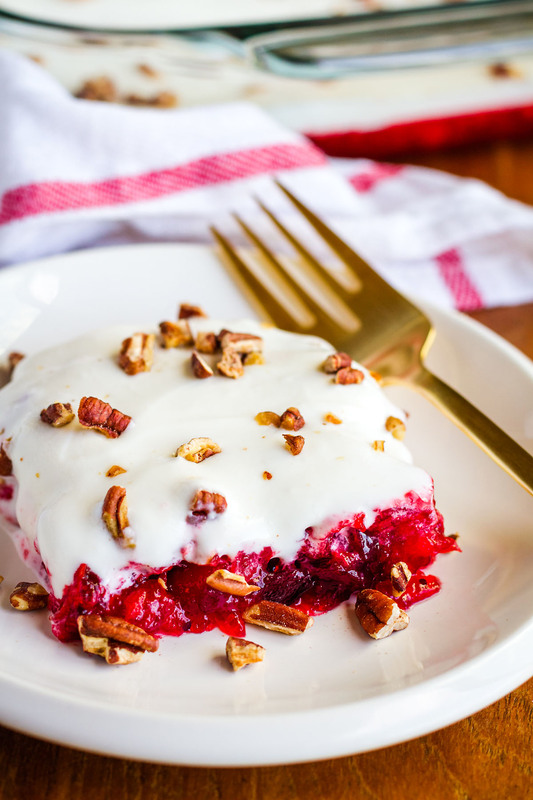 I am loving all the cranberry recipes this season and this dessert tops the list! Oh my gosh this is amazing! Thank you so much! This reminds me of a Jello salad my mom used to make. I love serving classic recipes like this at the holidays. Yum!